This comprehensive kit contains all the tests you need to keep your boiler working as efficiently as possible. This includes the Alkalinity test which helps prevent the build-up of scale and the tests for oxygen scavengers Tannin and Sulphite which help prevent corrosion. Testing for theses parameters as a preventative measure not only saves money on repairs; but also decreases the running cost of the boiler, as the boiler’s efficiency decreases as scale builds-up. TDS/Conductivity Eutech EcoTestr TDS meter, 1413, acetic acid and indicator solutions. Click onto selected tests to find the different options of purchasing replacement reagents – whether it is individual reagents you need or a set sold at a discount as a Reagent Pack. In addition to the reagents, the Boiler Water Test Kit also contains a sample pot, syringe, comparator, Phosphate HR disc and filter papers and holder. 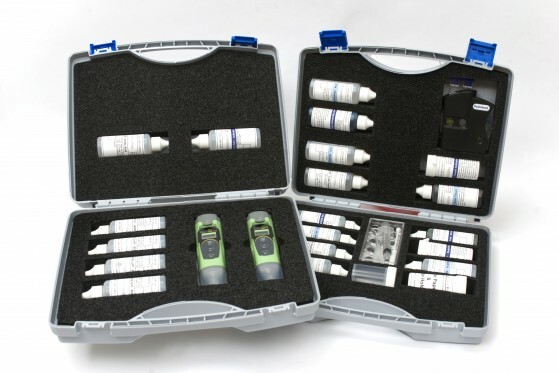 The meters and calibration solutions are in a separate case to rest of the Boiler Water Test Kit.